Volvo Penta’s IPS pod drive system with joystick control helps less-experienced boaters maneuver large vessels in close quarters and at slow speeds. The engine manufacturer has now turned its attention to making boat operation easier at higher speeds. "We think it’s extremely important that when you enter a boat you should feel relaxed and it should be a joy to use the boat,” Volvo Penta vice president of product management Johan Wasterang said. At a global press event in Sweden in late June, the manufacturer introduced an automatic trim tab system and high-speed joystick steering in a new integrated gaugeless electronic system called Glass Cockpit. It can all be married to the new juiced-up, quieter diesel IPS system. 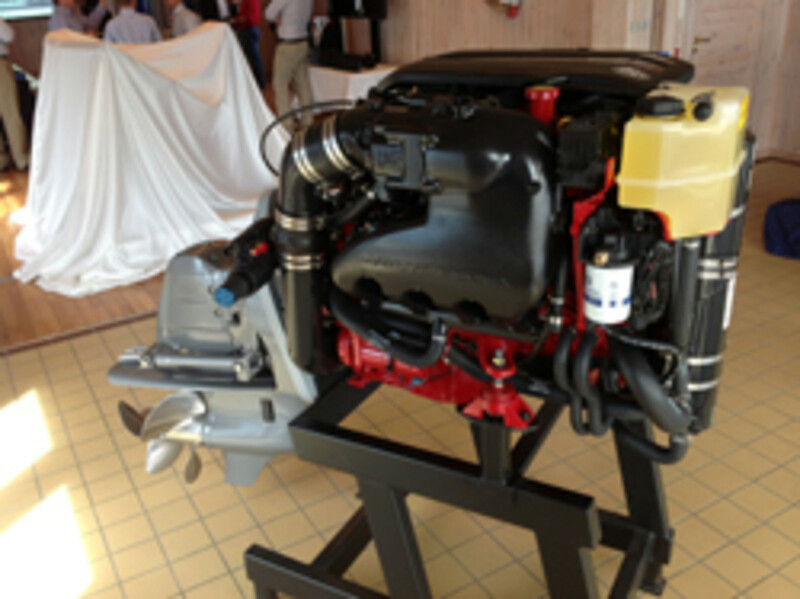 Volvo Penta also debuted a gas sterndrive engine: the V8-430. Click play for a look at the new offerings. Forty-five journalists from 14 countries were able to demo the new products, which were installed in six test boats from 25 to 55 feet at the Volvo Penta test center in Krossholmen, Gothenburg. A new generation of D11 inline 6-cylinder diesels will now power the IPS drive system. The package is a good fit for flybridge yachts and convertibles from 45 to 55 feet, Volvo Penta chief project manager Thomas Lantz said during his presentation. Horsepower has increased from 670 to 700 and 725. The engine will also be offered in a 625-hp version. An improved turbo and air filter generates the additional horses, a new air filter noise cap reduces engine noise by 2 decibels, and an upgraded cylinder head improves cooling, according to Lantz. Two new drive packages, the IPS800 and IPS950, will be linked to the new engines, resulting in a more powerful and responsive system, according to Volvo Penta. The IPS800 and IPS950 have new gear ratios that allow for a broader speed range — 20 to 40 knots, said Lantz. The V8-430 gas sterndrive engine joins the two engines introduced last year, the V8-380 and V8-225. The 430 uses the same 6-liter block as the V8-380, but Volvo Penta modified the engine for better air intake to boost power output. Pricing was unavailable. The products will be introduced at the fall boat shows, according to Volvo Penta. Executive editor Chris Landry was in Sweden to test the engines and try out the new products, so look for more in an upcoming issue of Soundings Trade Only.